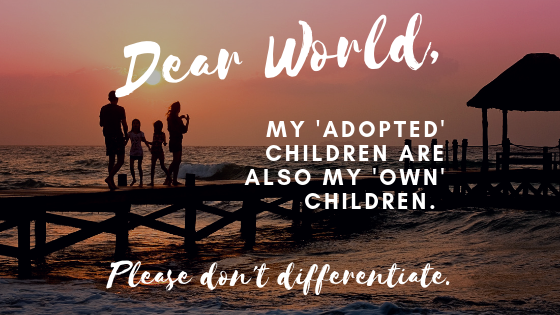 It’s National Adoption Week, which seemed like a good opportunity for a rant. As you know, I tend to blog positively and (I hope) humorously about adoption, and its impact on our family. It’s not all roses, of course, and I’m honest about the struggles of raising four children, two of whom have early life trauma, but generally our life is good and we have much to be thankful for. Please read the following, then, in the context of what you’ve just read. Our life is good. What I’m about to say is just a niggle, really, and it shouldn’t get to me – but, then again, it’s such a common faux pas, and one so easily fixed, that I’m surprised more people don’t realise the impact of what they’re saying. The niggle is this: people I meet are usually very interested in our adoption story. “What made you want to adopt?” “Did you always want to adopt?” and so on. Very good questions. In fact, any question is a good question. I like questions. They encourage honesty and transparency, both of which I’m a huge fan of. Does anyone realise how patronising that sounds? Not to mention how unsettling for my boys as they grow older and start to understand the full whack of what’s being suggested. 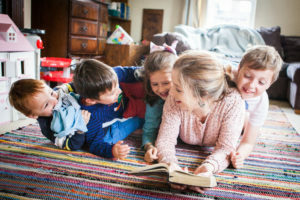 Are you really saying that, in some way, my adopted children are not as good, not as entitled, not as deserving of us as our birth children are? Are you really saying that my adopted children aren’t really mine? Are you really saying that there is some difference between how we would treat the four of them? Are you possibly suggesting that our adopted children don’t really fit into our family? That once they hit 18, they’ll be fending for themselves? Sure, I went through a lot to get my two birth children. There was the initial, er, act. And then nine months of the usual fatigue, nausea, increasing discomfort, pre-eclampsia, blah, blah, blah. And then a few more days of the same because which Rycroft has ever turned up anywhere on time? And then the labour. Urgh. And then the feeding, the sleepless nights, the reflux, the weaning, the tummy that refuses to bounce back. OK, maybe this last one is more the fault of insane amounts of chocolate consumption rather than the kiddoes, but you get the picture. These kids are my own kids, for sure. No one would doubt it. Legally, they are ours too – I can show you their birth certificates which bear my name. But then again, I went through a lot to get my two adopted children also. There were more than three years of discussing, praying, talking to adopters, attending events and meetings. And then a few frenzied nights of form filling, capturing every tiny detail of our lives in a seemingly infinite line of boxes: personal details, job information, financial situation, home safety audit, NSPCC safeguarding checks. You name it, we filled the form. And then there were two months of intensive social worker meetings – a bit like free therapy (we rather enjoyed this, I won’t lie). We shared the story of our own family upbringings, how the two of us met and married, the relationship we have with our birth children, our working history, our views and values on disability, ethnicity, sexual orientation, expectations of our children, and a whole range of other things. By the end of this stage, our social worker knew more about us than our closest friends. Oh, and four days of an adoption preparation course. Basically four days designed to put you off adopting. Then the panel, maybe just 15 minutes or so, but a dozen faces, each one prompting us to defend why we really could parent two more children. And then there was the waiting, the scrolling through child profiles, more waiting, the adoption event where I first caught a glimpse of their sweet faces, more waiting, the phone calls, the ‘what-ifs’, more waiting, the meetings, the plans, the starting-to-get-real moments, the decorating, more waiting, more forms, more meetings, more desperation to meet our own children. And then they moved in and we had regular visits from the social worker, health visitor and independent reviewing officer. Things Which Had To Be Done. Forms Which Had To Be Filled. Because, by heck, they don’t leave you to flounder with an adopted child like they do with a birth child. And – finally – nearly a year later, the court visit, the words, the photos, the celebration, the joyous knowledge – and the bit of paper which legally proves – that these are our children. OUR OWN CHILDREN. Calling them our ‘own’ children does not diminish the place of their birth family. It does not wish away a story which, however sad, is a key part of who they are. We still have indirect contact with birth relatives, and will continue to do so, maybe one day turning that into direct contact, if our boys are keen. No. Calling them ‘our own children’ gives them the total security of knowing they are totally loved, totally wanted, totally right in our family. They are not outsiders, they belong – and everything we have is theirs. There is nothing we give our birth children – in time, love, sacrifice or money – that we do not also give our adopted children. I’d argue that the journey towards our adopted children becoming our children was longer, busier and more intense than that which we made when we embarked upon birth children. Wouldn’t you agree? In that case, please can we all be a little more careful in the language we use? 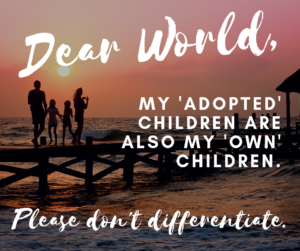 If you’ve appreciated this post, why not join the Desertmum community for weekly emails about adoption, parenting, faith and – let’s face it – whatever bandwagon I’ve jumped on for that week? Adoption: Is faith a disadvantage?